1. 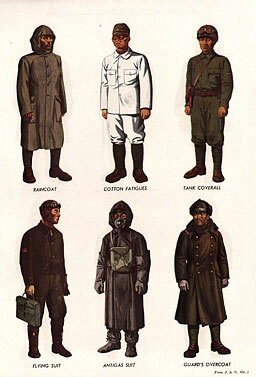 STANDARD UNIFORMS. a. Types. Aside from obsolete undress and special officer's summer dress uniforms, there are 2 distinct types of regular Japanese uniforms used in temperate regions: the model 90 (1930) and the model 98 (1938). Both types have woolen winter and cotton summer versions. 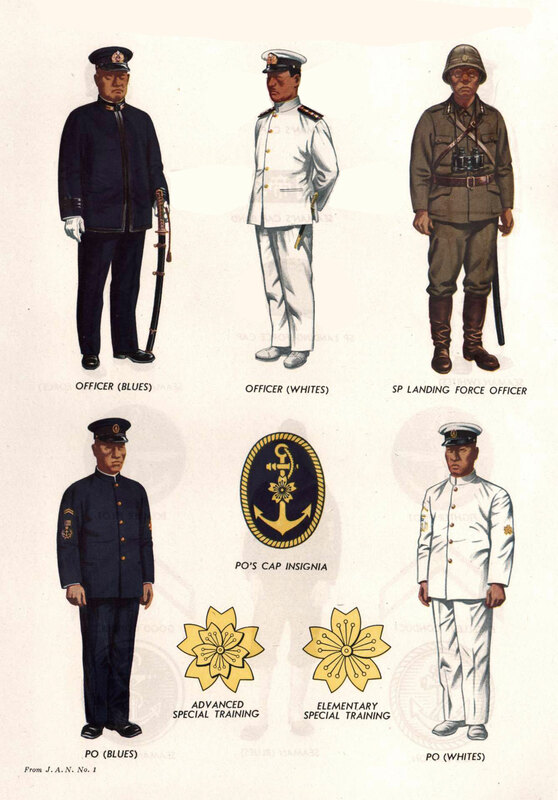 There are no government issue officer's uniforms; therefore, even within each type, these vary considerably from each other in cut, color, and material. 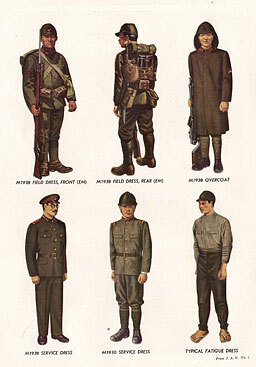 Various types of Japanese uniforms, together with items of personal equipment, are illustrated in figure 409 and plates I-VIII. 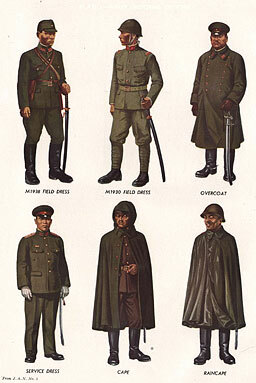 The older type M-1930 uniform, still worn by some Japanese soldiers, is made of heavy, mustard-colored, woolen cloth. The coat is not unlike the American coat of World War I. It has a high stand-up collar, to which the insignia of arm and unit are attached except when in the field. The newer type M-1938 uniform is olive drab in color and is made either of cotton or wool, depending on the season. The coat has a turn-down collar and four pockets with flaps. In the field the Japanese now ordinarily wear semi-breeches, cut high in the waist and held up by two webbing straps. Wrapped spiral puttees usually are worn by dismounted enlisted men. Officers wear puttees, boots, or leather leggings, with either breeches or semi-breeches. Long trousers without cuffs were worn with the M-1930 coat, but were covered with puttees, boots, or leggings in the field. e. Headgear. (1) Field cap. The field cap is made of olive-drab woolen cloth and is generally the shape of the head, with a narrow visor of the same material and a brown leather chin strap. It has a star along the vertical front seam. This cap may be worn under the helmet. (2) Steel helmet. Steel helmets are generally worn during combat. Webbing tapes tie under the chin or at the back of the neck. The star insignia also are worn on metal helmets. The steel is of inferior quality and the helmets are easily pierced or shattered. (3) Service cap. The service cap is olive drab in color and similar in shape to that of the United States Army, but it has a smaller crown and shorter visor. A red piping is inserted at the outer edge of the crown and the headband is encircled with a strip of red felt about 11/2 inches wide. At the front of the headband is a gold star. For officers and men of the Imperial Guards a semicircular wreathof leaves is fastened just below the star. The visor and chin strap are of black leather in standard military design. The dismounted enlisted man wears russet service shoes of pigskin or cowhide. The shoes are hobnailed and have a metal rimmed heel. Men of the mounted services wear russet riding boots or leather leggings and shoes. Officers' boots and shoes are similar in design, but are usually black. Rubber soled black canvas tabi often are carried as a second pair of shoes, especially in warm weather. 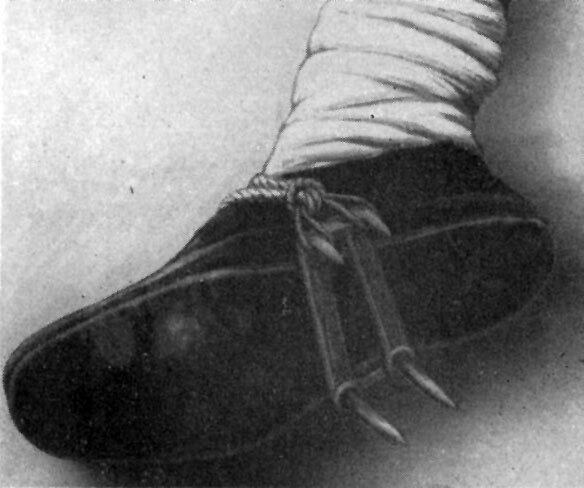 Most, although not all, tabi have split toes, which serve no special purpose but are characteristic of many Japanese shoes. The soles have ridge-like cleats under the ball of the foot for better traction. Japanese socks are typically heelless. Both woolen and cotton socks are used. The M-1938 overcoat for enlisted men is made of olive drab woolen material. It is single breasted and has a turn-down collar. For marching the lower corners of the coat buttons back behind the side pockets. Equipment is worn outside over the coat. An older type of overcoat is double breasted. 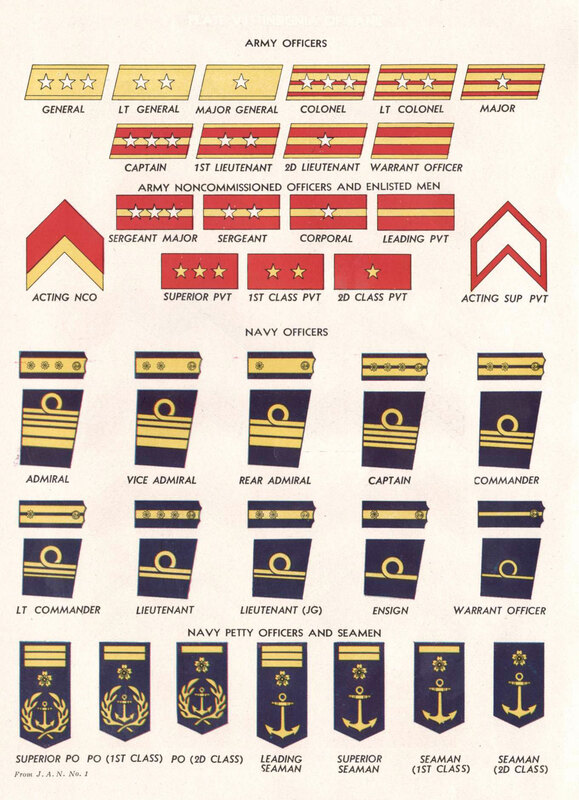 Officers wear overcoats of similar design, but have sleeve insignia, consisting of 1, 2, or 3 stripes of dark-brown braid on or above the cuff to indicate company, field, or general officers' grades respectively. Sometimes service dress capes also are worn by officers. All overcoats and capes are equipped with detachable hoods which button on. The throat piece, which gives good closure across the neck, carries 1, 2, or 3 strips as an indication of company, field, or general officer ranks. Cotton raincoats with hoods are issued to Japanese troops, but in most theaters they prefer to use the shelter half as rain protection. i. Clothing worn under the uniform. The Japanese often wear a breech clout, cotton or cotton and wool underwear, and cotton or cotton and wool shirts. Usually only the officers' shirts have collars. In hot climates, the breech clout sometimes is worn alone. j. Senninbari (1000-stitch good luck belt). This is a red sash, made with 1000 stitches and sometimes worn by Japanese soldiers around the waist under the uniform. It is supposed to confer luck, courage, and possible immunity from enemy fire. Figure 409. 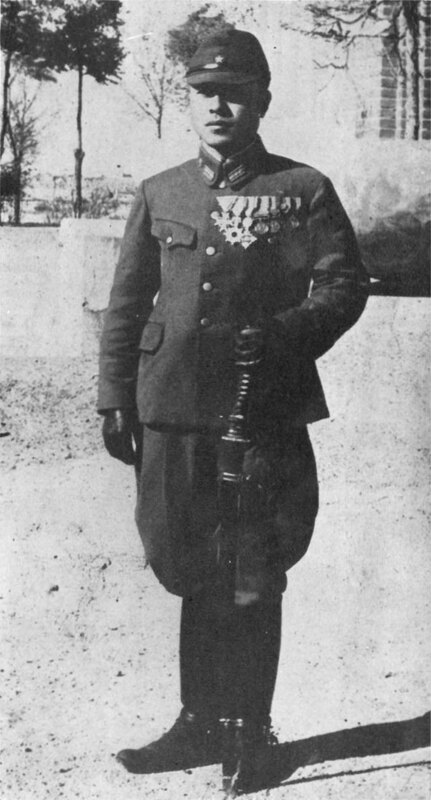 Japanese captain in winter service uniform. uniform. The suit which buttons up the front has a turn-down collar and a left breast pocket. b. Paratroops. The sleeveless cotton paratroop coverall is worn over the uniform and field equipment. It reaches to the knees and snaps tightly around the legs. c.Individual camouflage. The Japanese rely to a great extent on the individual to improvise his own camouflage methods. Troops are taught how to attach leaves, wisps of grass, and foliage to helmet and body camouflage nets. The body nets, some of which have mottled patterns, are used especially as a drape to conceal the outline of the body. In other cases soldiers sew loops of thread over their clothing to use for attaching foliage. 3. 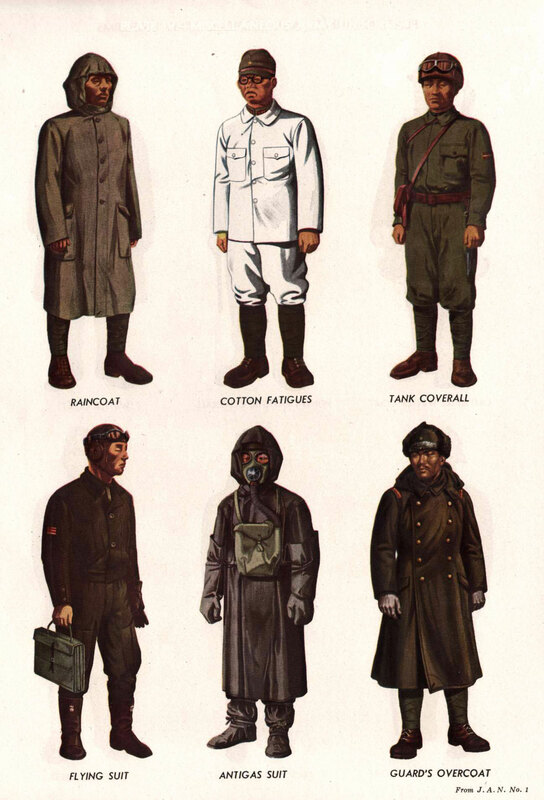 SPECIAL COLD AND HOT WEATHER CLOTHING. 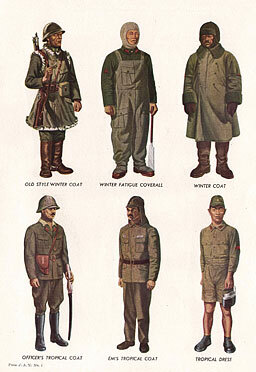 Japanese soldiers have been well trained in the use of cold weather clothing, and the different requirements of each individual are taken into consideration. They are well aware of the "layering" principle, adding or removing a layer of clothing as needed. 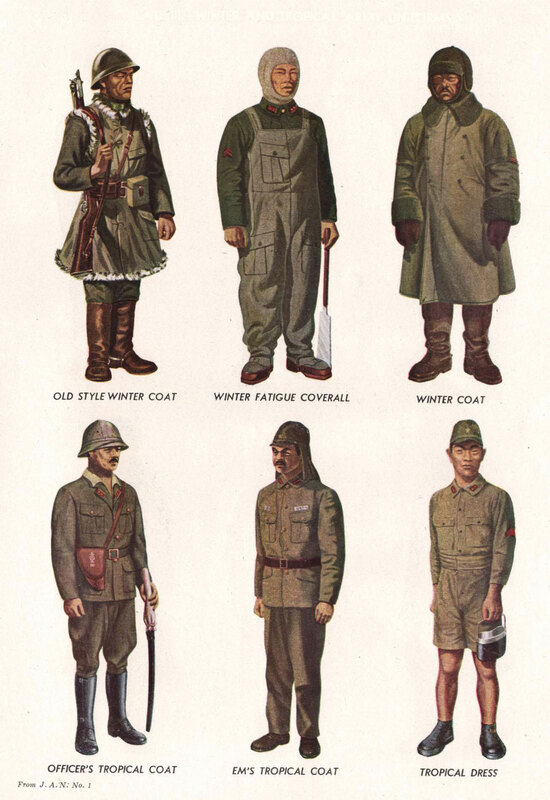 The Japanese jungle soldier is issued a minimum of clothing and equipment. Open throat cotton shirts, with either short or long sleeves, and cotton trousers, worn with spiral puttees, are the usual clothing. In some areas shorts are worn, but rarely in combat areas. (1) Pack. The Japanese have several types of pack, the commonest now is a sack of heavy duck about 13 inches square and 5 inches deep. This is believed to supersede the older pack which was made of cowhide with the hair on. The noncommissioned officers' pack is slightly smaller; a type of officers' pack, with a leather backing is even smaller. Inside, the pack ordinarily contains extra shoes (frequently tabi), a shelter half with poles and pins, extra socks, a towel, soap, toilet articles, sewing kit, first aid dressings, an extra breech clout, and rations for several days. Outside, a blanket or the overcoat is rolled in a horseshoe shape around the pack; a raincoat or the shelter half is attached across the top, and the mess kit is strapped to the back of the pack. The hold-all is frequently used in place of the pack. This is merely a piece of light canvas with cords at both ends for tying it into a roll. It is carried on the back or slung over one shoulder. Aside from regular packs, there are numerous sacks, pouches, and bags which are used for carrying grenades, ammunition, and special equipment. Some of these are made of heavy duck. Others were formerly made of leather or a combination of duck and leather, but now a rubberized fabric, not unlike the material used in belting, is being substituted for leather in all field equipment. This new fabric actually has certain advantages, especially in wet tropical regions where leather deteriorates rapidly. 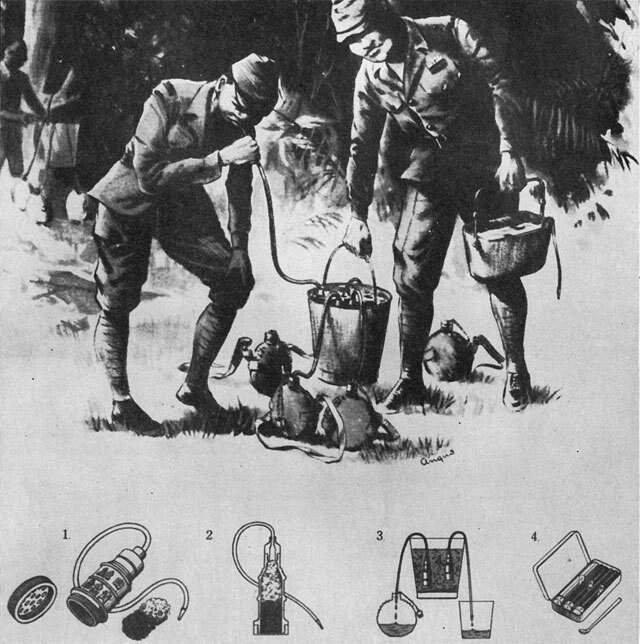 Aside from these special bags, many boxes or bagsused by the Japanese soldier are designed for ease in carrying. Figure 410. 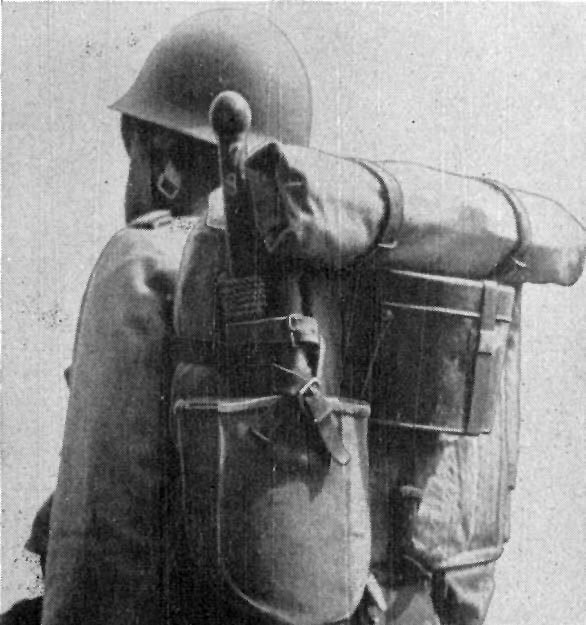 Japanese soldier with full pack. (2) Mess kit. The Japanese have the type of mess kit used by the Germans, Russians, and Italians. It consists of an aluminum container, with one or two tray-like dishes nested beneath the cover. In temperate and cold regions enough food for several meals is cooked and carried in the mess kit, ready to eat. (3) Shelter half. Although small by American or British standards, the shelter half is very serviceable. As a raincape it provides excellent protection against wetness and is preferred by many Japanese soldiers to the issue raincoat. A cord is attached to the middle of one end so that the shelter half can be suspended from the shoulders and tied under the chin. Loops through the eyelets on one of the sides then may be slipped through the eyelets on the opposite side to close it securely in front. Two of the corners rest approximately elbow high, allowing the arms freedom of movement. The shelter half also is used as a ground sheet, or to roll up in for protection in a foxhole. It can be pitched as a tent, either alone or in combination with varying numbers of others. A standard method of pitching requires 28 shelter halves. (4) Canteen. The canteen, which hangs from a shoulder strap and rests on the right hip in a network of webbing straps, is made of aluminum and painted brown. There are 1 pint and 2 1/2 pint sizes. gun grease. The bayonet frog is also worn on the ammunition belt. Formerly all this equipment was made of leather, but recently it has been made of rubberized fabric. (6) Entrenching tool. Entrenching shovels and picks carried by the Japanese are in the ratio of 2 shovels to 1 pick. The shovel has a short wooden handle which is removed from the blade when it is attached to the pack. A rope is attached from the upper end of the handle to a hole in one of the upper corners of the blade so that when the shovel is assembled it can be slung over the shoulder. b. Cold weather equipment. (1) Sleeping gear. Even in cold climates the Japanese are unacquainted with the sleeping bag. Instead, woolen blankets which have an exceedingly high percentage of cotton are used. The inefficiency of this sleeping gear is clearly demonstrated by the fact that seven blankets were issued to each Japanese soldier after the landings on Attu. The Japanese also use a cotton filled sleeping pad about 3x5 feet in size when sleeping in barracks or tents. This does not, however, appear to be part of field equipment. In the field Japanese soldiers ordinarily take shelter in foxholes, covering themselves merely with their shelter halves. (2) Mess kit and canteen covers. Most field equipment used in cold climates is the same as that used elsewhere. However, because of the possibility of food or liquids freezing, snug fitting mess kit and canteen insulation covers, made of insulating material such as kapok or pile, are provided. (3) Skis. The Japanese use two types of skis, the standard normal length ski and the short glacial ski. Although the standard skis are of orthodox construction, the quality is generally quite poor. The short glacial skis, averaging about 41/2 feet in length, are of fairly heavy construction; they are inflexible but easy to carry. Experienced skiers generally use the long skis, while novices are given the shorter one. A simple, but rather inefficient, metal and leather binding is used with both types of skis. The Japanese do not issue a special ski boot but simply adopt a standard service shoe by putting steel protectors on the edges of the sole and a special plate on the heel to hold the heel-strap in place. Such improvisation probably gives the skier only limited control over his skis. Ski poles are made of light cane. Plain web straps serve as ski climbers for uphill traction. (4) Snowshoes. The Snowshoes used by the Japanese are of standard European type, oval and smaller than the usual American bearpaw Snowshoe. (5) Ice creepers. Although it is believed that the Japanese do not have specific mountaineering equipment, such as used by German, Italian, British, or American mountain troops, they do have ice creepers which are strapped to the sole of boots for better traction. These are T-shaped with a spike at each of the three ends. c. Special tropical and jungle equipment. (1) Tree climbers. Extremely light weight treeclimbers (fig. 411) are used by snipers. These consist of a framework of metal rods tied under the instep by means of a long cord. There are two sets of spikes which always point straight down from the sole of the foot. The two spikes on the outside of the foot are about an inch long, while the inner ones are only about 1/2 inch long. (2) Water purification. (a) Water filter-purifier. This item is issued to Japanese troops in the field for purifying drinking water. It is not considered safe enough for use by Allied troops. The use is illustrated in figure 412. Two chemically treated wads, one either green or blue and the other white, are located on the inside of the plastic body. The end of the rubber tube is placed in the mouth, and untreated water is sucked past the chemically treated wads. When the water begins to flow, the tube is placed into a canteen or other receptacle and allowed to siphon. The cotton wadding must be replaced after 5 canteens have been filled. (b) Water purification kit. Phials of water purification chemicals and a measuring spoon, contained in a flat tin, are provided as additional equipment for use in an emergency or when large quantities of impurities are found in the water. (3) Protection against insects. (a) Mosquito headnet. The Japanese headnet usually has spring wires at the top and bottom, connected by a third piece of spring wire in the form of a spiral. This frame keeps the rather coarse green netting off the face when it is being worn, but permits it to be collapsed flat for easy carrying. The net also is used to camouflage the head and neck. (b) Mosquito gloves. Lightweight cotton mittens are used by the Japanese to protect the hands from mosquito bites. They have slits in the palms so that the fingers can be freed to fire a rifle. (c) Insect repellent. The Japanese insect repellent consists of a cream the essential constituent of which is citronella. (d) Mosquito bars. The mosquito bar is used in rear areas. 5. 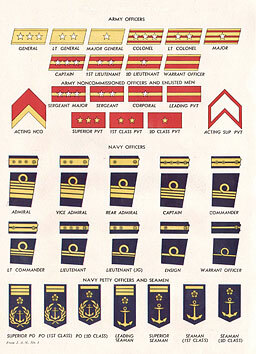 INSIGNIA, DECORATIONS, AND AWARDS. a. Insignia. Insignia of grade are worn on the collars of coats when coats are worn, or on the collars of shirts when no coats are worn. When wearing heavy cold weather clothing, insignia of rank generally are worn on either sleeve. Insignia of branch or service usually are worn on the right breast of either coats or shirts. 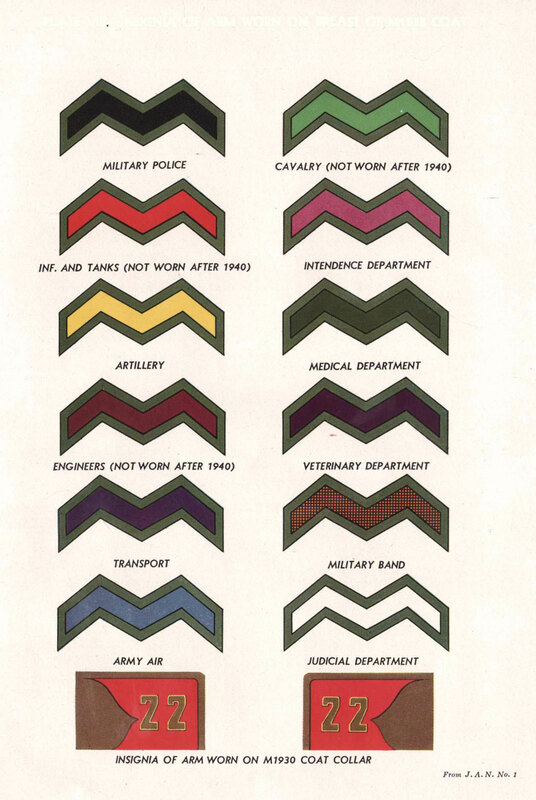 However,in combat areas, neither officers nor men ordinarily will wear any insignia of rank or branch of service. 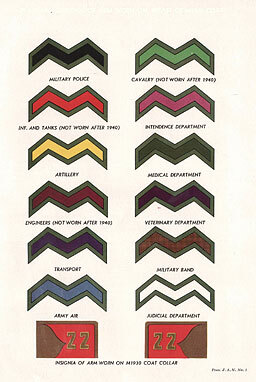 Commanders of infantry often will wear some special insignia, such as crossed sashes of dark color, to enable their men to distinguish them. Recruits wear a white patch, sewed or pinned on the left breast of coat or shirt, on which is written their name and unit. In combat areas, all enlisted men may wear such a patch, containing general information and occasionally, some mark of rank. (1) The Order of the Golden Kite. This decoration is purely military and is awarded for conspicuous service in operations against a foreign country. There are seven classes of this order, each carrying a life annuity. Enlisted personnel may be advanced only to the sixth order. (2) The Order of Rising Sun. This decoration is not limited to the military, and is awarded to those who have rendered meritorious services. There are eight classes of this order, of which two are available to enlisted personnel. Foreigners occasionally are awarded this decoration. (3) The Order of the Sacred Treasure. This decoration is awarded in both peace and war and is not limited to the military. It is awarded for long service with good conduct and does not carry a life annuity. There are eight classes, of which two are for enlisted men. (4) In addition to these three principal decorations, medals for distinguished service (Kunko Sho), meritorious service (Kunro Sho), and exceptional service (Koro Sho) are issued. For those whose services are "not inconsiderable," but are not qualified for these three medals, a monetary award may be granted. Campaign medals, good conduct medals, and badges for proficiency in different branches of the service also are awarded. (a) Diploma of merit. This may be awarded to either a unit as a whole or to individuals for distinguished service in front of the enemy. (b) Wound badge. This is granted to anyone who, as the result of being wounded in action, thereby is entitled to an increase in pension in accordance with pension regulations. (c) Medal for next of kin of those killed in action. This is also issued to the next of kin of anyone who has died within three years after contracting an illness resulting from active service. 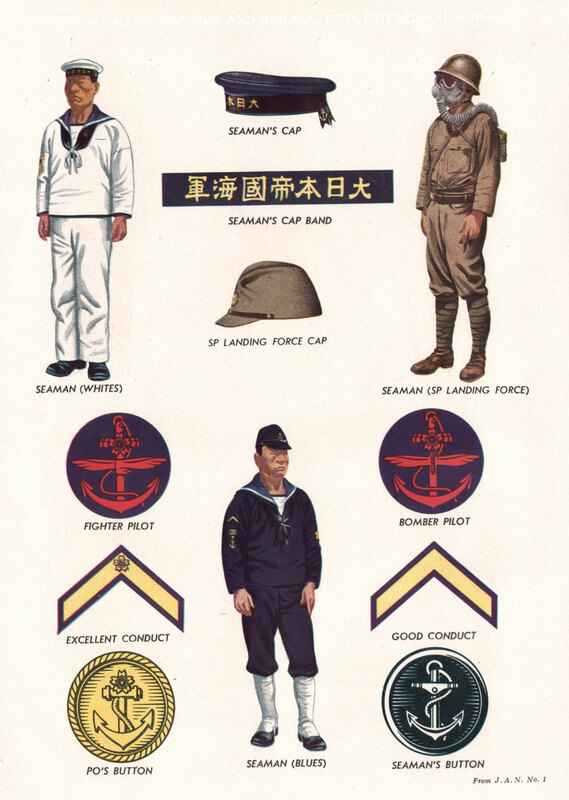 Good conduct badge (Kinko Sho). Good conduct certificate (Zenko Shosho).